Understanding of ssl Private | Public Key infrastructure. Test playing https with Gmail. Apply config to Apache server. Apply config to Windows 2003 IIS server. 1. Test playing https with Gmail. Let's see what happen when playing https with GMail. Subject : it looks like the one who uses certificate (the buyer). 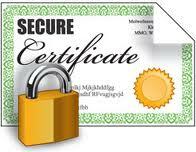 Issuer : the ssl certificate provider (the seller). Let find about Thawte in the ca-bundle.crt file. Very clearly, the default CAfile has alot of info about Thawte CA. 2. Let's make our self signed certificate for running https. Of course, it is different with your file. Generate the Certificate file with the uppon Private Key. Notice to enter your full server domain name. Let's see the human-readabled information in the Certificate file. As you can see, the Subject (buyer) and the Issuer (provider) are identical. The Certificate file (include the Public Key equivalent to the Private Key). 3. Apply config to the httpd (apache) server. Check if the apache server has support for ssl. If not, install mod_ssl by yum. Point the mod_ssl config to use the 2 above files. Yep, of course it will error because your Cert is not included in the ca-bundle.crt. You can always bypass this warning by chosing Add Exception / Permanently Store the Certificate. So, all the 3 ways above (curl, s_client, firefox) will get Certificate Error/Warning Message because you used a self-signed Certificate. But you can always bypass the Warning Message at anytime and https will work fine.